The big news in our neck of the woods – or more accurately – our cove of the bay – is that SeaWorld has just announced that it is phasing out the Orca show performances at its San Diego park. They will be phased out sometime in 2016 – which means they could go on for another year. And replaced in 2017 with a “new orca experience”one with a more “natural” setting. 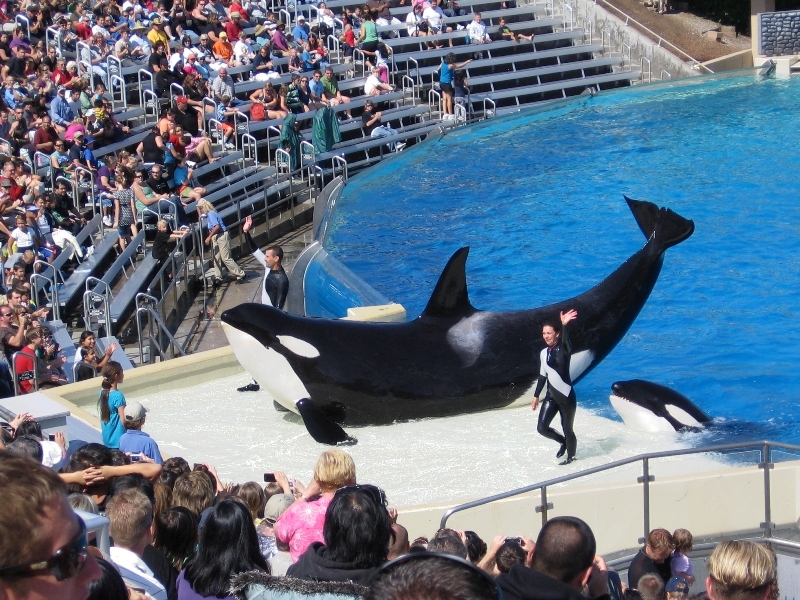 The changes do not affect killer whale shows in Orlando, Florida and San Antonio, Texas, where they own other similar parks with orcas. The good news is that the parent corporation has finally responded to the pressures exerted by activist groups, media coverage, falling attendance figures, politicians, government commissions, and the huge backlash since “Blackfish” was released in 2013. There has been a tidal wave of public sentiment changing. Why, just today, the San Diego U-T is running a poll on whether you support SeaWorld’s decision to end the orca programs. With nearly 11,000 votes, 61% are saying the support it ot 38% opposed. Nearly weekly protests outside SeaWorld gates by PETA and supporters, a recent ban on orca breeding by the California Coastal Commission in October, and then just last week, a California Congressman, Adam Schiff, announced that he would introduce legislation in Congress to prohibit the breeding, wild capture and import or export of the whales. Manby added that customers in San Diego have changed their tastes, that they want more of a natural experience – reflecting how orcas behave in the wild, and that their guests don’t like actions that appeared to be tricks. This is big news, and everybody is writing about it – from BBC to Rolling Stone. “An end to SeaWorld’s tawdry circus-style shows is inevitable and necessary, but it’s captivity that denies these far-ranging orcas everything that is natural and important to them. This move is like no longer whipping lions in a circus act but keeping them locked inside cages for life or no longer beating dogs but never letting them out of crates. PETA Foundation Director of Animal Law Jared Goodman said in a statement. Fortunately, not everybody has lost some of the details. Lisa Halverstadt at Voice of San Diego luckily has focused on one of them, the efforts by SeaWorld to either build a hotel at its San Diego site or purchase one already built.